All pets deserve a full physical examination at least once a year. At Little Mountain Veterinary Clinic the annual physical exam takes about 20 minutes. Make sure you are bringing a list of your questions and observations of your pet. We have put together a slide show to show you what you can expect to see during the examination. Dr Banyard will ask you questions regarding what you are seeing at home. For pets in their adult and senior years we recommend annual blood and urine testing. If you are interested is having these health screening tests please be sure to ask us about this and the costs involved. These provide a baseline of what is normal in your pet – if there are abnormalities these will be discussed with you when the results come back. The complete annual exam in the following slide show is what Dr Banyard does and is not reflective of what other veterinarians at other clinics do. The above slide show outlines the reasons for examining the different parts of the body and shows some of the tests recommended depending on what is found during the examination. 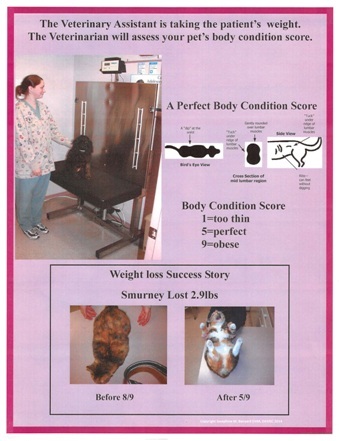 The physical exam allows the owner and veterinarian to assess the physical health of the pet. The findings provide a baseline for the following year. Dr Banyard often finds problems that the owner is unaware of. As the examination proceeds the pet owner can bring up any concerns they have of discuss their observations about their pet’s health. Any abnormalities are recorded in the medical records and tests and treatment options are discussed. What is done will depend on the wishes of the owner. If the pet is health then vaccinations can be updated if needed.